This quick summer salad makes for an easy meal. The recipe came together by chance one afternoon while I was visiting my parents. For as long as I can remember we have had our own tomatoes every summer. Growing up on those sweet little gems forever spoiled me from store-bought tomatoes. Although cherry tomatoes from the store can sometimes be fairly sweet, this dish, like anything with tomatoes, is incomparably better with those from your own garden. If you must buy yours at the store, get the sweetest sort possible. The world-famous Venetian merchant and explorer Marco Polo is largely credited with introducing the European mind to the mysteries of the Asian continent through his book, Livres des merveilles du monde. And just like Marco Polo, this dish has Italian origins, but an eastern perspective. I drew my inspiration from a Mario Batali recipe I discovered on Luisa Weiss’ Wednesday Chef. 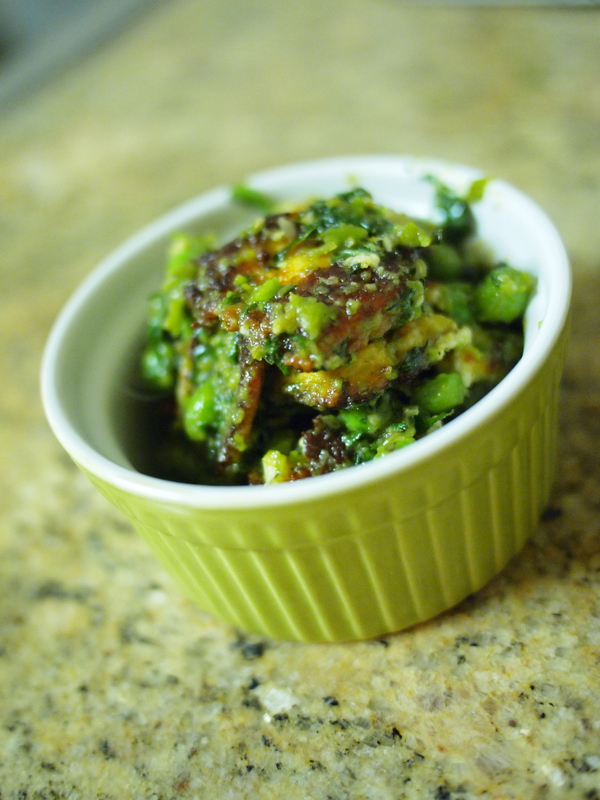 The original calls for paparadelle pasta tossed in a savoury-sweet spring flavored sauce of peas, honey, and mint. Those wide flat noodles really soak up this bright sauce brilliantly. The original is fantastic, and you should try it, but the pea purée that is the basis for the sauce is so good, that I find myself wanting it far more frequently than I am willing to indulge in macaroni. So I set off on my own little mental silk road in search of a suitable noodle substitute. And, like Marco Polo himself, I was met with great fortune in the east. 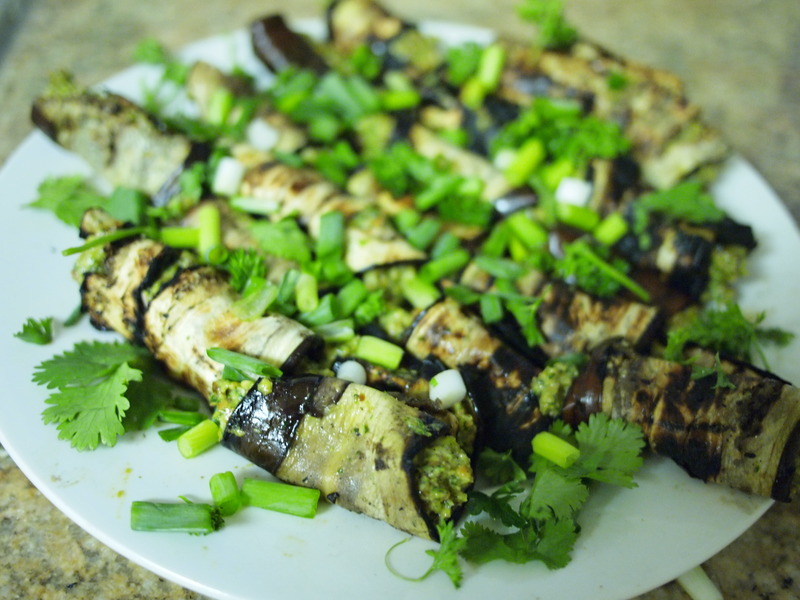 One of my favorite methods of preparing eggplants has always been grilled aubergine roulettes. You might remember my recipe for aubergine roulettes with goat cheese, but this recipe with its savoury herbal pistachio stuffing takes the cake. Though I don’t really follow a diet, my general attitude is stay away from processed, and highly refined carbohydrates. 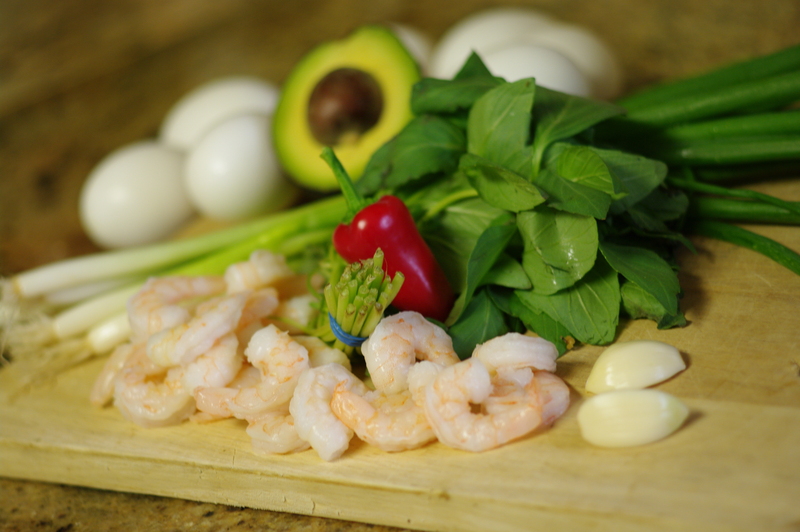 I stick mostly with fresh vegetables, fruits, leafy greens, lots of dairy, and good meat and seafood. Coincidentally, the layout of my dining habits happens to correspond to a lifestyle people have been talking a lot about lately – the paleo diet. Apparently, eating like a paleolithic caveman has numerous health benefits. The theory is that metabolic evolution does not take place apace with intellectual and technological development, and the energy content of our modern diets has long since outstripped our bodies’ processing power. This has led to the so-called obesity epidemic, and countless other modern health problems. Paleovores assert by eating only foods for which our metabolisms have been evolutionarily calibrated, we will experience a newfound sense of vigour, and do wonders for our health. On a basic level, the idea makes sense. Living in northern California has a lot of nice aspects. The weather is consistently fantastic (except this year). San Jose is also pancake flat, so I can cycle or walk basically anywhere. All the good weather is great for gardens too. Everything grows well here, and there is always something in season. 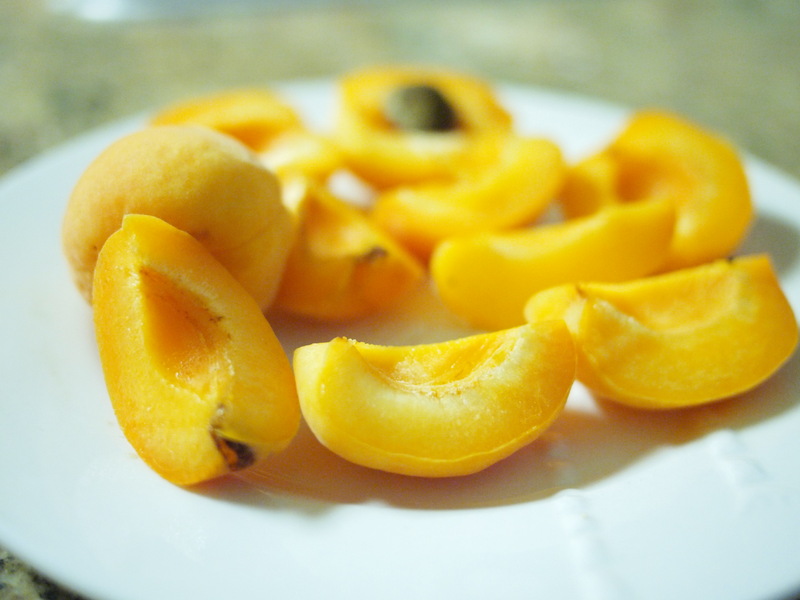 The second half of summer is time for stone fruits, and as luck should have it, I noticed an apricot tree teeming with ripe fruit last night while walking to dinner. This treasure was sitting in the middle of a fenced-in abandoned lot nestled behind a 7-11. I made a mental note, and walked on to have a fantastic Vietnamese dinner at Vung Tau, one of San Jose’s many excellent Vietnamese restaurants – the amazing diversity of people and treats being another plus of living here. After having mustered up courage while considering the name shaking beef, we started to make our way home. As I passed the apricot lot, I glanced about to make sure the coast was clear, and with one deft swoop I was over the fence, and into the land of milk and honey. I had bought some trifles at 7-11 beforehand so I could get a plastic bag, and once up in the branches of the apricot tree, I filled it to the brim with ripe fruit. 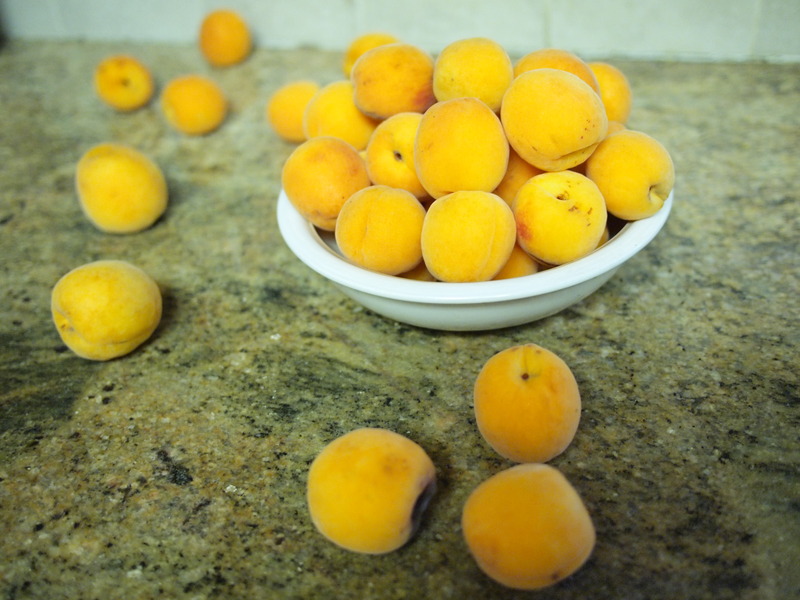 Almost as soon as I was in the lot, I was back over the fence with the mother-lode of apricots, and back on my way home. Even though my days currently consist of the thrilling little death march of bar study, and the stress of dealing with a crooked mechanic, little adventures like this make life worthwhile. Thank goodness for summer time. 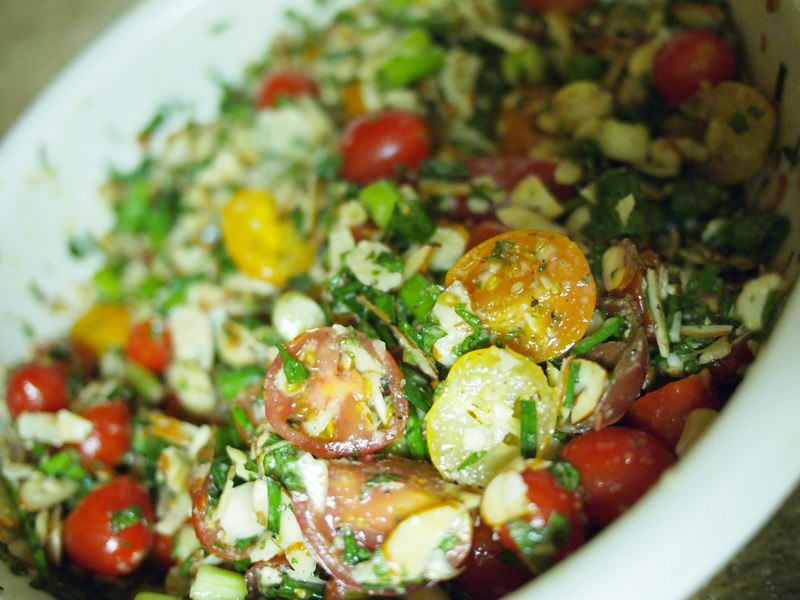 This quick, simple salad is one of my kitchen standbys whenever dill is in season in my garden. The honey softens the slow, low burn of the Serrano, and the cucumbers really mop up all of the flavors in the dressing. 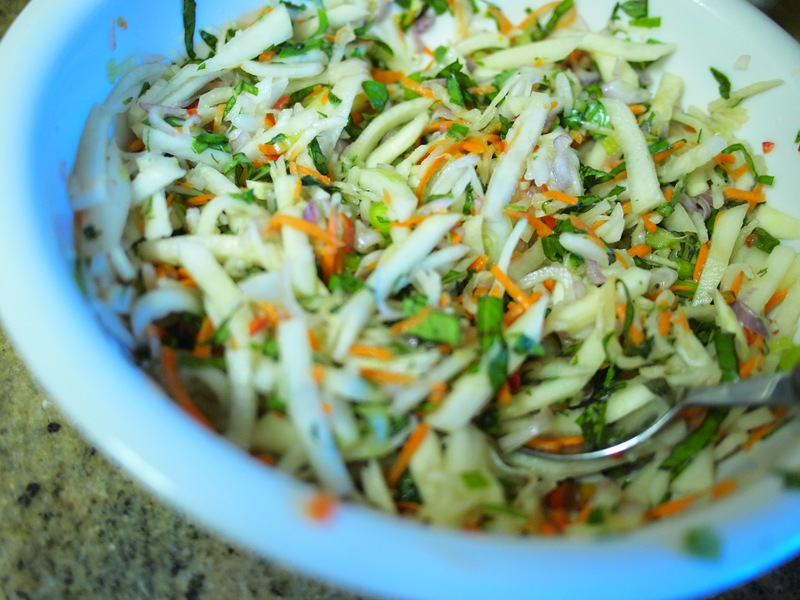 The fresh, crisp crunch of cabbage as background rounds out the mix. 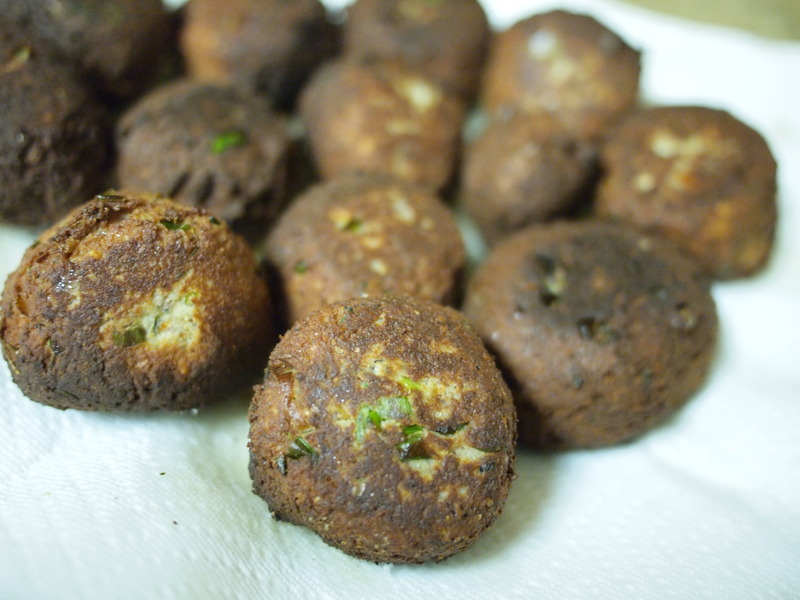 I served this last night with the shallot-basil burgers of the previous post, and it was a great pairing. I’d say my guests reaction is a good indicator of how tasty this is. As good as those burgers were, and they were, the salad was demolished in much shorter order, while a few patties still remained as leftovers by the end of the evening. Few things in life conjure up such positive associations as burgers. They are classic American summer fare, and are inextricably linked to thoughts of freedom, blue skies, warm weather, cold drinks, and good company. No matter how hard things might be at the rat race, knowing that you can always come home and stoke the barbecue flames till they lick the sky is a source of constant comfort. Everyone has something to complain about, but the solace of the backyard kitchen is an eternal refuge for the work-weary. Over the coals, worries melt away like fat dripping from juicy patties, and after that first tender bite, the savoury trinity of char, spice, and smoke brings repose to troubled hearts, and satiety to rumbling bellies. 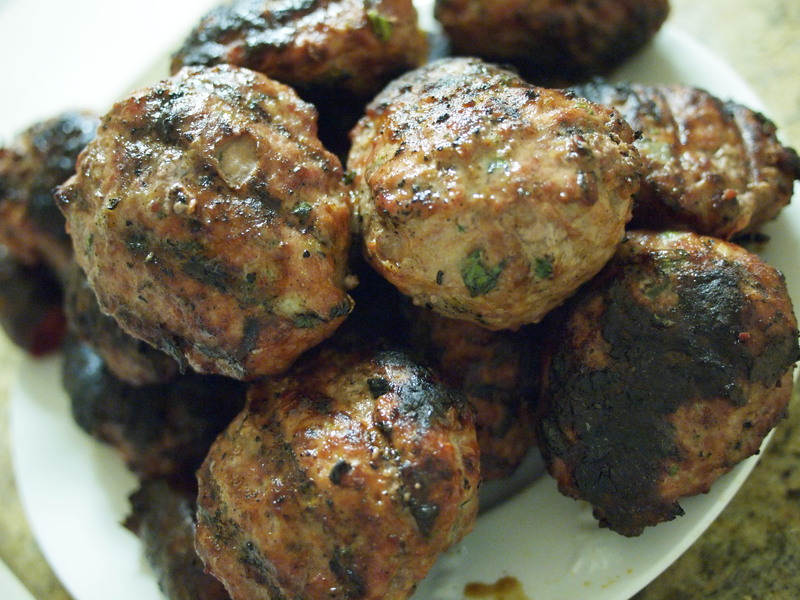 Recently the LA times ran a feature on the best burger recipes from reader submissions. Some of the burgers selected in this little contest sounded so mouth-watering that I could not help but be inspired to craft my own burger recipe. Now, all of the recipes ran in the feature had slightly ethnic twists to them – the german-cuban pork, the southwestern, the mexican. To me this really demonstrates the versatility of a burger. If the thing itself weren’t such a solid foundation, then it wouldn’t support all the variations on a theme so well. But, because a burger is such a classic, it is important to not stray too far, or else that underlying greatness might get lost in the enthusiasm and confusion of experimentation. After I had read that article, I realized I had some leftover Thai basil, and shallots, from the kohlrabi salad earlier this week, and was taken with a flash of inspiration. It is still too hot in San Jose to turn on the stove for any reason, and this light, crispy kohlrabi salad with just a touch of heat is a quick, simple dish well suited for this season. I brought it to a small fourth of July bbq last night, and it was a huge hit, with people coming back for fourths and fifths. The sweet, cool flavors of honey and rice vinegar highlight the refreshing crunch of kohlrabi complemented by the fragrant southeast asian flavors of Thai basil and hot pepper. As I mentioned before, older, larger kohlrabis tend to get pithy and bland in taste. The smaller, and fresher the kohlrabi used for this salad, the crispier, and more pronounced the flavors will be. 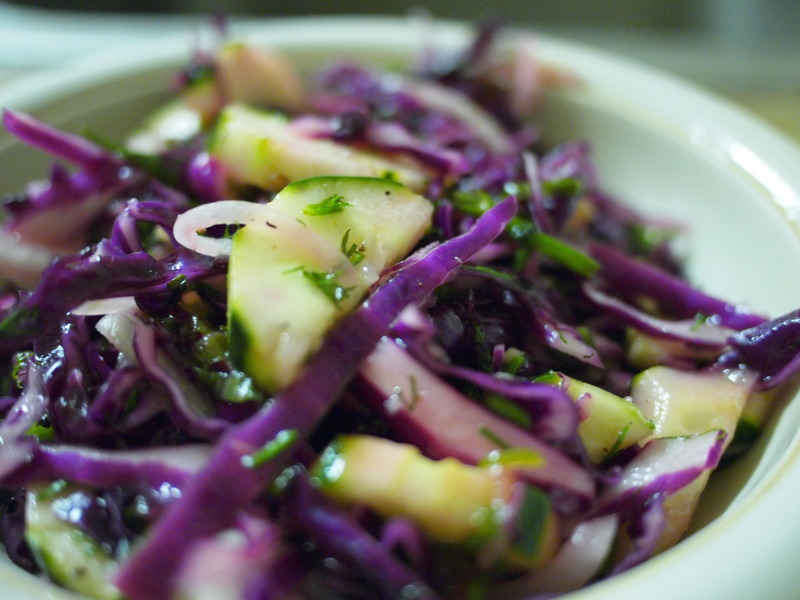 The kohlrabi in this dish is cut into match sticks, then salted to remove some moisture. This makes the kohlrabi even crispier, and reduces the strong cabbage smell that cut kohlrabi can give off if allowed to sit. Thai basil can be found in almost any asian market, and differs from sweet basil in appearance on account of its thicker purple stems and flowers. The flavor profile of Thai basil also features anise notes much more prominently than sweet basil, but, in a pinch, the regular Italian stuff will still make a decent substitute. The shredded carrot and daikon mix, a standby of Vietnamese cuisine, gives the dish some more substance as well as a nice flash of color. If you are lucky enough to have a Vietnamese market close by they will likely have a pre-prepared shredded carrot and daikon on sale for pennies a pound. This stuff is a universal Vietnamese side, topping, and base for salads and pickles – a sort of Vietnamese answer to sauerkraut. If you see it pre-made on sale, it is worth buying, not only because it is delicious, but also inexpensive, versatile, and keeps for sometime. Some markets sell it both fresh and pickled. The pickled stuff is called đồ chua, and could be used in this dish, but the flavors will be altered. So, if possible, stick the fresh variety. Absent Vietnamese markets, a box grater will make for easy shredding of about 2 carrots, and one half a daikon radish. This post has been a long time coming. My little recipe repertoire project slumbered through a hard winter. And, even though things are still not easy yet, summer is in full swing. For those morningbird songs we don’t hear other times in the year we can still be thankful. It is from just these sort of summer feelings that this spontaneous recipe takes its inspiration. 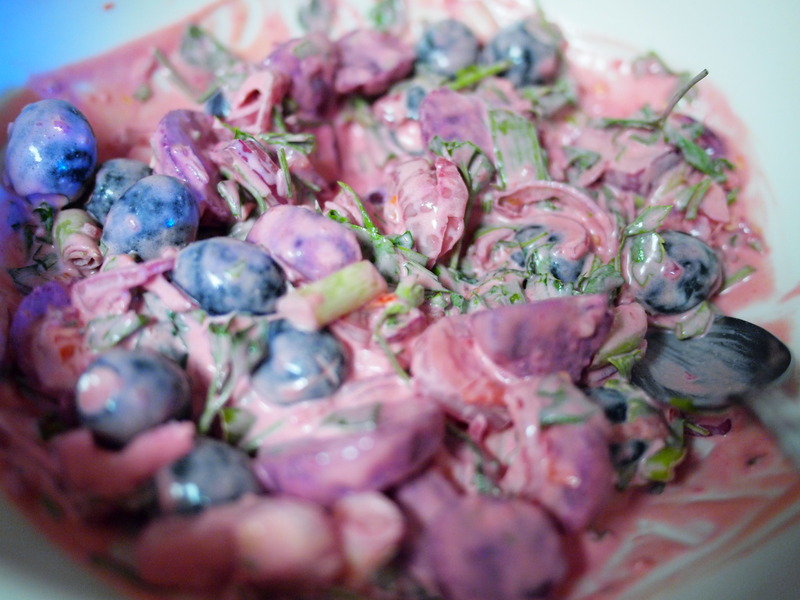 You see, the epic, day-glo pink color of this salad is a classic feature of a mainstay of the Latvian summer diet – cold beet soup. That soup, however, is really quite different from this salad, aside from its color, and, a recipe for another day. Nonetheless, just having celebrated the summer solstice, things Latvian coupled with a new sense of energy have been polka-ing about my thoughts. This salad is a product of just that. And, so, this little piggy’s kitchen is back in operation. Cūciņa cucina ir augšamcēlusies! Being as my life is consumed with my study for the California bar exam, my time for grocery shopping has been ever so slightly inhibited. Yet, as the modern world knows, brains need calories for thinking. If I weren’t to eat at all there’s no way I could pass this test. In difficult times, we make do with what he have on hand. In fact, sometimes, like today, the results come out brilliantly. Cold beets and cream when combined create a fantastically brilliant pink color. That combination is one, that to me, is classically summery. When served cold this is just the sort of freshly cool and light food to fend off the wispy hunger pains peculiar to hot summer days – those feelings of pestering emptiness, which, stunted from full-fledged hunger by the heat, have us squeamishly demur from the heavier dishes of cooler seasons. Here, this color combination works as a base for a piquant cold vegetable salad, that surprises with both the vibrancy of its looks, and tastes. This was fairly tasty. Unfortunately, law school consumed my life for a while, just like preparing for the bar exam is doing now. My memories of the detail of this recipe were consumed therewith. I hope you will at once forgive me , and condemn the institutions of legal education in the united states for this loss. Cūciņa Cucina by Miķelis Munters is licensed under a Creative Commons Attribution-NonCommercial 3.0 Unported License.